Tavormina G - "Variability of Mirtazapine utilization" (Actas Espagnolas de Psiquiatria, 2001; 29: suppl 1: 306). Tavormina G – Consulting Editor issue 3 of Cutting Edge Psychiatry in Practice (CEPIP) – The management of bipolar spectrum disorder – (SEPT) --- august 2013. Tavormina G – "An introduction to the bipolar spectrum" - The management of bipolar spectrum disorder (CEPIP); august 2013; 3-6. 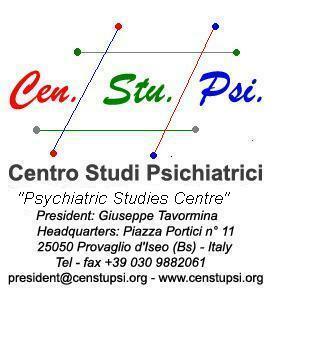 Tavormina G – "The temperaments and their relevance to bipolar spectrum disorders" - The management of bipolar spectrum disorder (CEPIP); august 2013; 19-21. Tavormina G – "Some somatic symptoms are important evidence for an early diagnosis of bipolar spectrum mood disorders" - The management of bipolar spectrum disorder (CEPIP); august 2013; 192-94. Tavormina G – "A clinical diagnostic-therapeutic long time evaluation of 30 cases reports of bipolar spectrum mixed states" (Psychiatria Danubina, 2013; 25: suppl 2: 190-93. Tavormina G, et al – "Luce sul male oscuro - Throwing light on a dark problem" (Sardini Editore), september 2013. Tavormina G. “Treating the bipolar spectrum mixed states: a new rating scale to diagnose them”. (Psychiatria Danubina 2014; 26 (supp 1), 6-9). Tavormina G – “Clinical utilisation of the ‘GT-MSRS’, the rating scale for mixed states: 35 cases report”. (Psychiatria Danubina, 2015; 27: supp 1: 155-59). Tavormina MGM, Tavormina R, Tavormina G, Nemoianni E – “A questionnaire to assess social stigma”. (Psychiatria Danubina, 2015; 27: supp 1: 328-331). Tavormina G – “An approach to treat bipolar disorders mixed states”. (Psychiatria Danubina, 2016; 28: supp 1: 9-12). Tavormina MGM, Tavormina G, Tavormina R, et al. – “Thinking of psychiatric disorders as a ‘normal’ illness”. (Psychiatria Danubina, 2016; 28: supp 1: 125-131). Tavormina G, et al.- Clinical utilisation and usefullness of the rating scale of mixed states, (“GT- MSRS”): a multicenter study. (Psychiatria Danubina, 2017; 29: supp 3: 365-67). Tavormina G – “Il trattamento degli stati misti: nuove proposte per nuove linee-guida”. (Telos, 2017; supp ottobre 2017: 7-13). Tavormina MGM, Tavormina G e Tavormina R – “Malattia mentale e pregiudizi: studio multicentrico sullo stigma sociale”. (Telos, 2017; supp ottobre 2017: 61-70). Tavormina G - How understanding the temperaments can help clinicians to make a correct diagnosis of bipolar mood disorders: 10 case reports - (Psychiatria Danubina, 2018; 30: supp 7: 398-400). Tavormina G - Can writing poems and taking photos help the psychiatrist to improve his humanity and the mental health of his patients? - (Psychiatria Danubina, 2018; 30: supp 7: 648).